When art restorer and occasional Israeli agent Gabriel Allon is sent to Zurich, Switzerland, to restore the painting of a reclusive millionaire banker, he arrives to find his would-be employer murdered at the foot of his Raphael. A secret collection of priceless, illicitly gained Impressionist masterpieces is missing. Gabriel’s handlers step out of the shadows to admit the truth—the collector had been silenced—and Gabriel is put back in the high-stakes spy game, battling wits with the rogue assassin he helped to train. I really enjoyed this one! I felt like I got to know Gabriel, and the other recurring characters, a little better this time, but in a completely different setting: Switzerland. It’s clear from the beginning that Silva has done extensive research into Switzerland’s WWII history. Although this book is full of information about Swiss banking and Nazi Germany during WWII, I never felt like I was listening to a history lesson. Full of mystery, intrigue, beautiful music and artwork, I felt like I was taking a fast-paced tour of Switzerland and the surrounding region – with plenty of daring spy-work to keep my heart rate up. 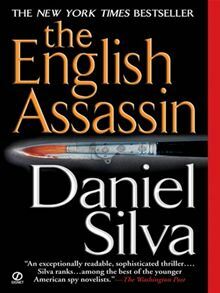 The English Assassin had a completely different feel to me than The Kill Artist did and for that I give it extra kudos- it can’t be easy for an author to stay true to a character like Gabriel and still produce such a different and interesting adventure, leaving the reader wanting even more. I’m quickly becoming addicted to this series! I gave The English Assassin 5 Sunshines and I’m hoping Book 3, The Confessor, continues the thrill! If you’re looking for the latest Gabriel Allon adventure, you can download Portrait of a Spy here.